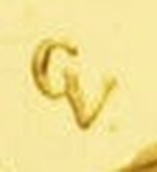 This unknown mark can be found, for instance, on the 1 sentimo coin (KM#238). 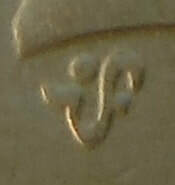 This unknown mark can be found, for instance, on the 5 piso coin (KM#272). Sometimes there is nothing to be found abou﻿t a mark. If y﻿ou have any information about these marks, please contact me. An acknowledgement will be added. This is probably a designer mark: "F.ORC.P." 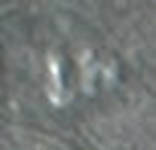 which can be found on a 20 centesimos coin (KM# 195) from Chile. This mark can be found on the 1 peso coin from 1974-1981 just left of the right shoulder of Bólivar. It looks like an 'E' or a 'w'. Maybe it is part of the design, but I think it just might be a designer mark. Some sort of spade can be seen on the bottom of a 100 korún from 1983 (KM# 108). Found, for instance, on the 5 piso coin (KM#272). Found on the famous Swiss 1935 20 francs gold coin (KM# 35) in combination with the Bern (CHE) mint mark. Nobody seems to know what the letter stands for. Maybe a reference to the designer Fritz Ulysse Landry? 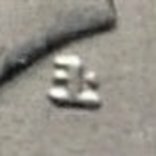 I found this mark on a Swedish 1 krona coin, KM# 814, just underneath the head of King Gustaf V. It is probably a designer mark and it looks a mirrored 'E' with an 'L' attached and a dot above. ​Probably for foreign trade only. Looks like two towers or castle.